Why Did the UN Security Council Visit Haiti? 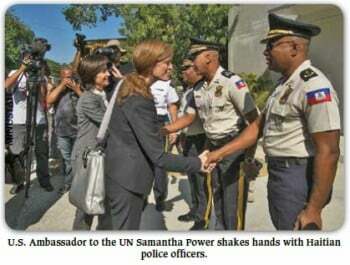 On Jan. 23, a delegation of the United Nations Security Council arrived in Haiti for a three day visit. The delegation, consisting of representatives of 15 member states currently on the Security Council, was co-chaired by Chilean ambassador Cristian Barros Melet, who holds the rotating Security Council presidency for January, and Samantha Power, the U.S. Ambassador to the UN. Many are questioning the purpose of this visit, which comes on the heels of Martelly carrying out a virtual coup d’état in Haiti. Because Martelly managed to hold no elections for over three years, Parliament expired on Jan. 12, and he now rules by decree. Meanwhile, several huge demonstrations take place every week in the capital and across Haiti demanding that Martelly resign and the UN military occupation, known as MINUSTAH, leave. Does Haiti have a mere “electoral crisis” ? No, Haiti has a much deeper political crisis where the Haitian masses are mobilized to demand Martelly’s resignation, a new provisional government to hold free, fair, and sovereign elections, and an immediate end to UN military occupation of Haiti by some 7,500 troops. It would have been more honest if the Security Council delegation said that it came to “assess” the utter failure over the past almost 11 years of MINUSTAH, which has been deployed in Haiti since Jun. 1, 2004. Although called the UN Mission to Stabilize Haiti, the occupation force has never done that. On the contrary, the MINUSTAH helped to unconstitutionally overrule Haiti’s electoral council in 2011 to place Martelly in power and then has backed him up as he has engaged in flagrant corruption, arbitrary repression, political arrests, and the dismantling and abuse of Haitian democratic institutions, including the judiciary and the Parliament. Then these foreign patrons have the gall to present themselves as the watchdogs of representative democracy and of human rights. Samantha Power articulated this cynicism when she stated that “we informed President Martelly and his ministers of our disappointment that he was not able to find a compromise and avoid the departure of parliamentarians.” How absurd! Over more than three years, he couldn’t find a compromise? In short, the UN Security Council did not come to evaluate a decade of failure, the massacres of our fellow citizens, or the unleashing of cholera in Haiti by MINUSTAH troops, which has claimed more than 9,000 lives. Instead it came to reinforce a neo-Duvalierist regime, which has now become a patent dictatorship. 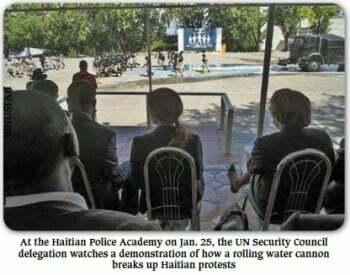 It is not surprising that the UN Security Council, like the Organization of American States, both of which are simply instruments of Washington’s foreign police, are supporting the unacceptable in Haiti. To top it off, the Club of Madrid, an imperialist pressure group of former world leaders, will send its fourth delegation to Haiti from Jan. 27 to 29, 2015. This delegation will be led by former Mexican President Felipe Calderón and former Bolivian President and Club of Madrid Vice-President, Jorge Kiroga. Like the UN Security Council, the Club of Madrid will be asking for elections under the aegis of President Martelly and the MINUSTAH. The Haitian people, however, have made and continue to make their demands clear: that free, fair, and sovereign elections will only be possible without Martelly or MINUSTAH.